Built for the Glasgow and New York Steamship Company. Sold to the Inman Line in 1859 along with her sister ship Glasgow. Chartered to E. Bates and Company in 1870 and then chartered by Telcon from E. Bates & Co. in 1870 and used for cable laying for two years before being purchased outright. Fitted with one forward paying out-picking up machine which was mounted on the port side as was the aft paying out machine. Four cable tanks were fitted, No 1, 26 ft dia by 7 ft 8 ins deep; No 2, 32 ft dia by 22 ft deep; No 3, 32 ft dia by 22 ft 6 ins deep; No 4, 24 ft dia by 12 ft 6ins deep; giving a total capacity of 40200 cubic feet. Sold in 1875 to the Eastern Extension, Australasia and China Telegraph Company, bought back by Telcon in 1879 and then sold out of the cable world in 1880 to Stoomvaart Maats, Insulinde, Amsterdam and renamed Amsterdam. Sold again in 1880 to Adamason & Ronaldson returning to her original name of Edinburgh. 1882, sold to James Adamson of London. 1885, sold to the Italian Government and taken to Venice for a refit and new name Eridano. 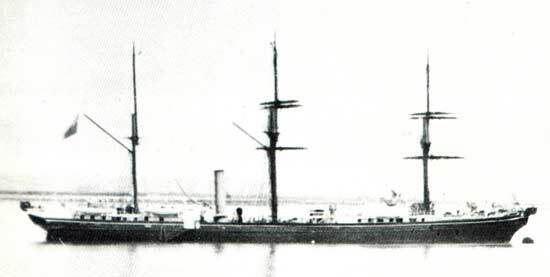 Used as a troopship during the Abyssinian Campaign of 1886 and later as a hydrographic survey vessel. In 1905 became a stores ship for the Italian Naval Torpedo School, by 1907 reduced to a hulk, finally being scrapped in 1917.